This is a photo of today's small £6 veg box - curly kale, white cabbage, dried chillies, salad leaves, oriental greens, and potatoes. 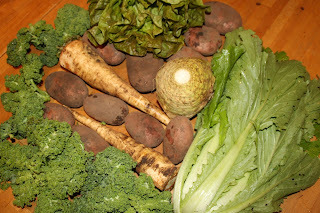 Today's standard £10 veg box contained - potatoes, parsnips, oriental greens, Brussels sprouts, dried chillies, white cabbage, curly kale, and swede. 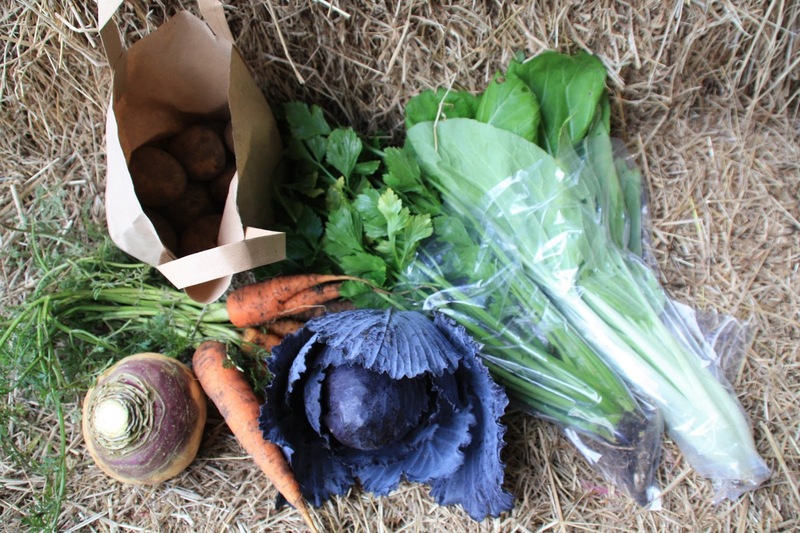 We always have opportunities for new veg box customers, so please get in touch with us today to order yours! 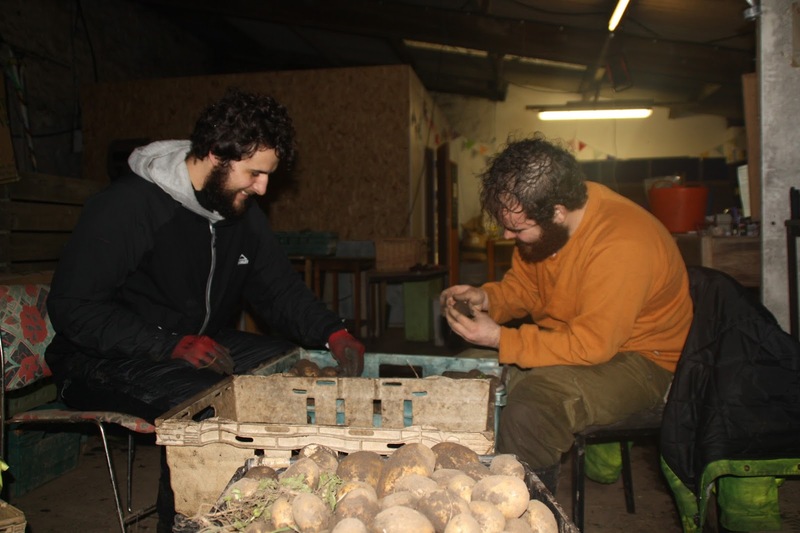 Pierre (from Holland) and Maki (from Greece) both left the farm last Monday to move on to their next wwoofing destinations, after several weeks volunteering with us. We would like to thank them for their help, and wish them well in their next placements. 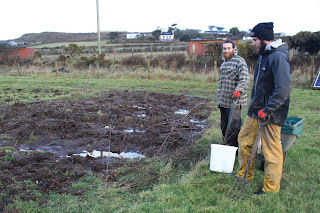 Maki (on the right) about to enter the Jerusalem artichoke swamp, with Vincent (sorry, we didn't get a photo of Pierre!). New opportunity on the farm. This is today's small £6 veg box, which contains a headed lettuce ("marvel of four seasons"), potatoes ("sarpo mira"), red cabbage, celeriac, parsnip ("tender and true"), and oriental greens. Today's standard £10 box contains all the above, with mixed salad leaves instead of lettuce, with extra potatoes, extra parsnips, curly kale and beetroots. 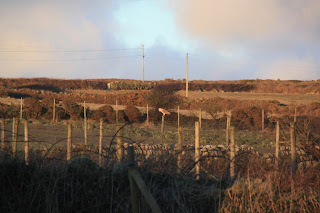 Although we regularly see barn owls hunting over the farm at dusk, usually as we are putting the chickens to bed, today is the first time I've managed to photograph one, albeit it at a distance. 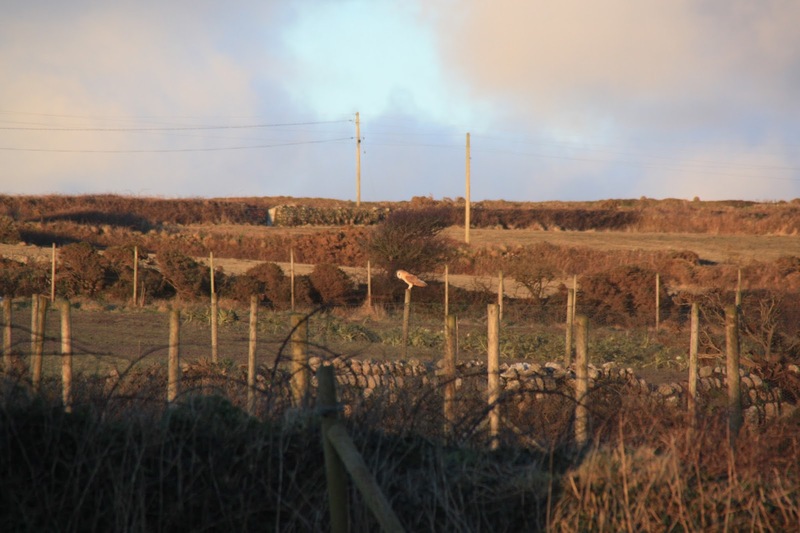 A barn owl perched on top of a fence post overlooking our purple sprouting broccoli beds. 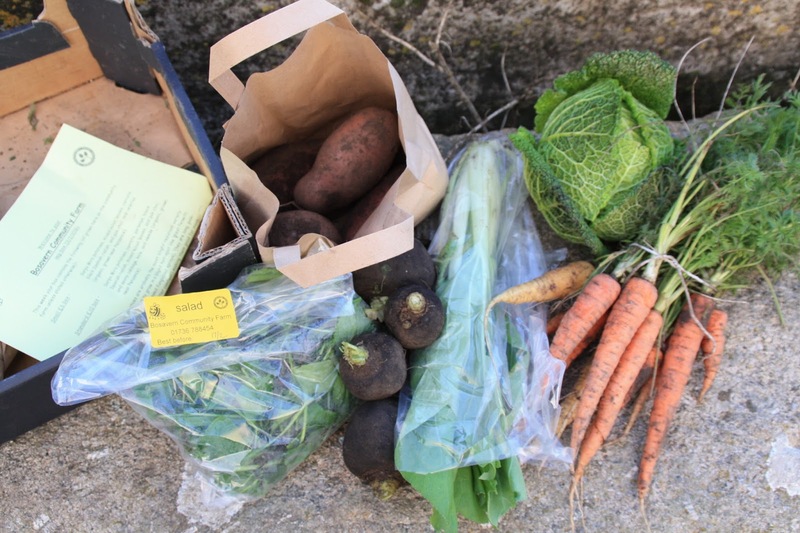 This week's small £6 veg box contains a bag of mixed salad leaves, a kilo of Sarpo Mira potatoes, half a kilo of black Spanish radish (delicious grated for coleslaw), pak choi, a bunch of carrots; and a savoy cabbage (grown organically near Penzance). 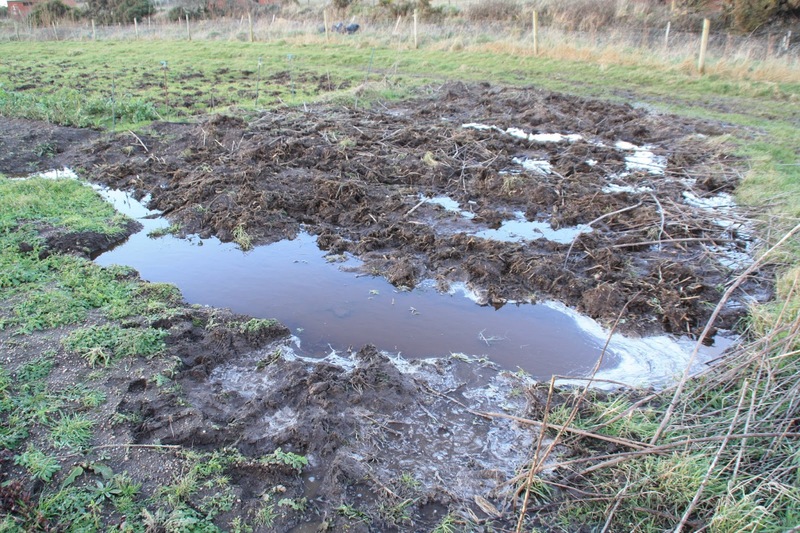 On Monday 8th February, winds of 71.4 mph were recorded just over the road from the farm. Our oldest polytunnel, the Mothership, had a gaping hole ripped in the plastic over the top, and will need re-skinning later in the year when the weather calms down and warms up. She had already been damaged over Christmas, and patched up, but this time she's beyond repair. The plastic was only two years old, which is disappointing. 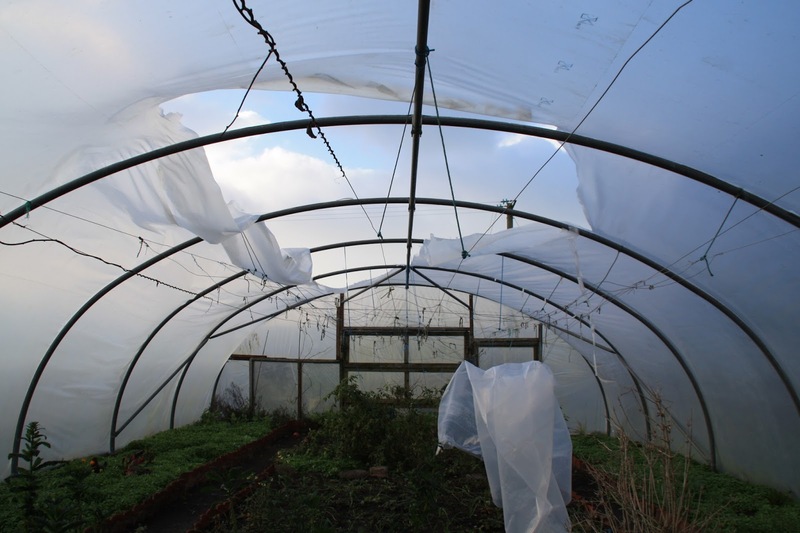 We cut the large flaps of plastic away to stop them catching the wind and potentially damaging the frame, then kept well away out of concern for our safety for the rest of the day. Now we hope that the crops inside the polytunnel will survive the rest of this harsh winter without too much damage, especially our perennial rocoto chilli bushes. We were more concerned for our strawberry beds, so we have used the sheets of plastic cut from the tunnel to cloche them, to try to keep the worst of the weather off. 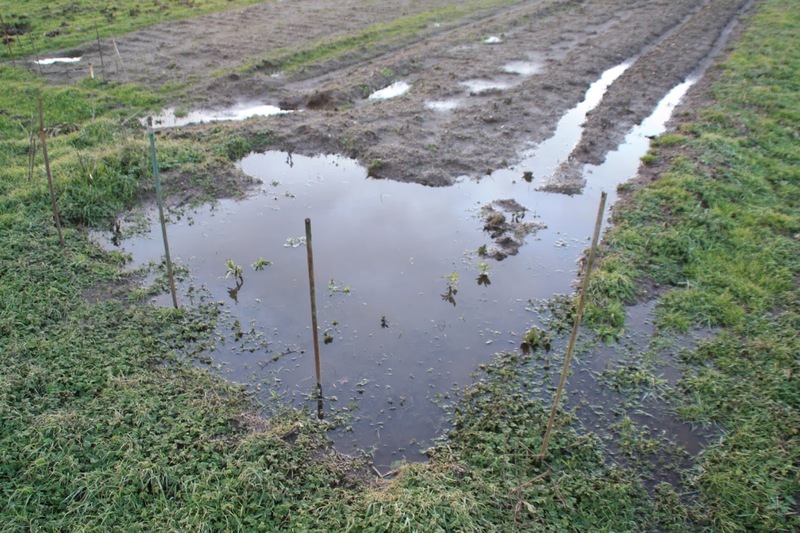 No other major damage has occurred (that we know of), although some areas of the market garden are under water. Our jerusalem artichoke bed - rather than digging them up we now have to sift them from the soil using our splayed fingers. 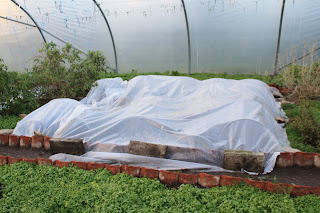 The end section of our early sowing of broad beans, most of which have not made it through the winter (neither have our over-wintering onions, 90% of which have rotted in the ground). 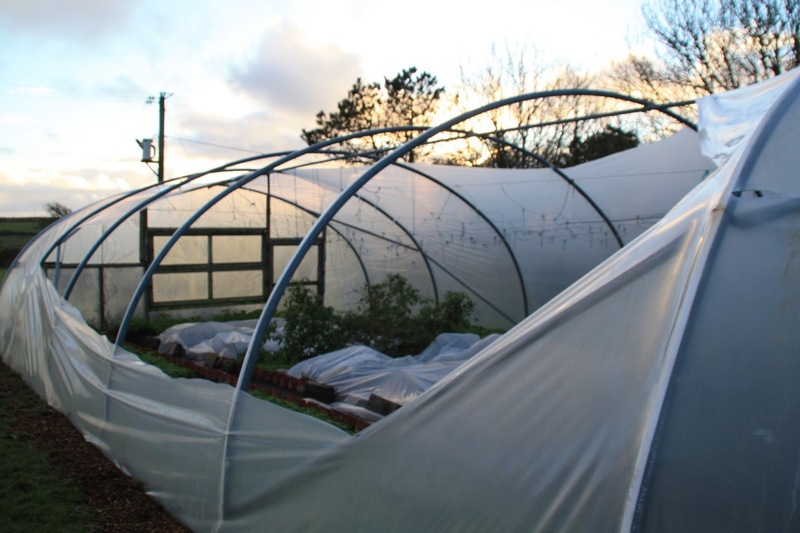 But this winter's worst storm has given us a name for our seventh polytunnel, erected last spring - Imogen - and here she is full of salad (well, we picked 8 kg of leaves today so she's actually looking a bit sparse...). In the photo you can see where rain has driven in through the gaps around the doors at either end. 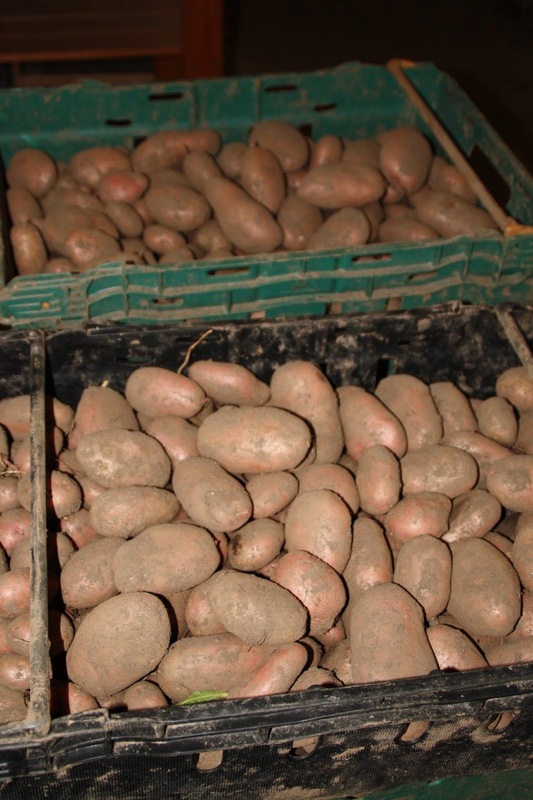 Sarpo Mira potatoes are probably the most blight resistant variety currently available (we hope there are more in the pipeline), making them ideal to grow in a blight-susceptible area such as West Penwith (we do not resort to copper-based fungicidal sprays to combat blight, even though these are allowed under some organic certification schemes). 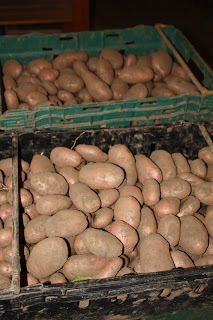 Sarpo Mira are long, pink-skinned, and floury (having a high dry-matter content) making them good for mash, chips and roasting. The other night I made a three-root gratin with them, using potatoes, swede and celeriac, plus the delectable full-fat milk we sell in the farm shop - delicious! 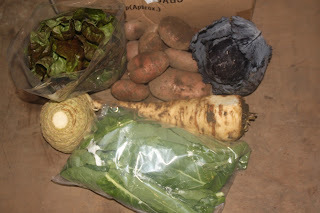 This was the small £6 veg box of Friday 5th February - 1.5kg of Sarpo Mira potatoes, 0.5kg of parsnips, a head of Chinese cabbage (the first time we've grown these, and they have been successful enough in the polytunnels over winter that we'll continue with them), a lettuce; plus some curly kale and a celeriac from a local organic farm. 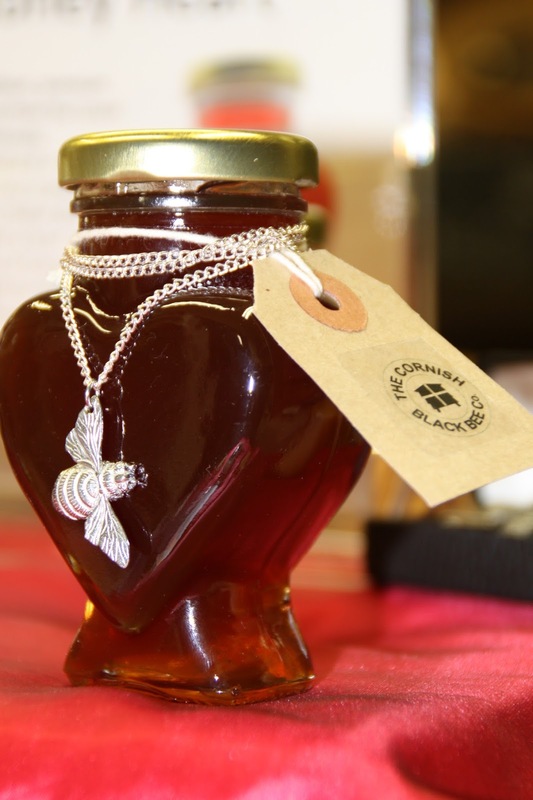 In our farm shop (open 11am till 6pm every day) we now have a range of romantic gifts available for Valentine's Day, from the Cornish Black Bee Company (who tend the hives on our farm). Pictured above is a stylish heart-shaped jar of heather honey from the Lizard Peninsula, with bee necklace. We also have heart-shaped candles, honeycomb candles, raw chocolate, and savoy cabbages. So why not bee romantic, honey? Ziv, from Jerusalem (our only Israeli wwoofer to date) is heading home tomorrow via London, after 5 weeks volunteering with us - we'd like to thank him for all his help and hard work whilst on the farm, and wish him the best of luck in any onward travels. These are the contents of last Friday's small £6 veg box - a pak choi, a head of celery (that's the end of our celery until the autumn! ), a bunch of carrots, a kilo of Valor potatoes; plus a swede and red cabbage from Cargease Organic farm near Penzance. The standard £10 veg box contained 2kg of Valor potatoes, a bunch of carrots, half a kilo of parsnips, a bag of mixed salad leaves, a lettuce, a portion of pumpkin (and that's the last pumpkin until the autumn too! 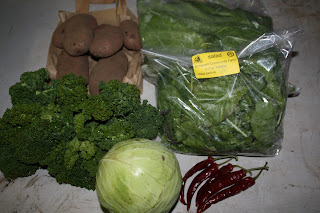 ); plus a swede, red cabbage, and a bag of green curly kale from Cargease Organic farm near Penzance. 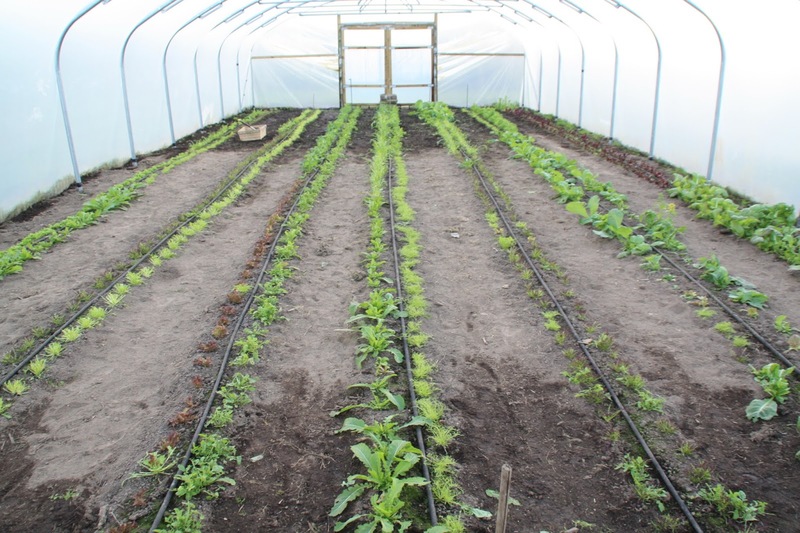 We can supply local organic full-fat milk, local organic bread, and our own free-range eggs in your veg box as added extras. Call us on 01736 788454 to try a box next week.